Credit: Melody Lee, Qiaochu Li, Joseph Chiang, Larry Chang, Rahul Nagarkar. Emotionshop is a project at Carnegie Mellon University’s Entertainment Technology Center with the goal of exploring how game mechanics evoke emotions. Like our predecessor, the Experimental Gameplay Project, our team of five prototypes as many games as possible, with each person making one game in 7 to 9 days centered around an emotional theme. So far, we have done 28 games for 7 different emotions, namely, serenity, gloating, shame, daring, pride, hurt, and appreciation. Just like how there are art and music theory on the emotional effects of visual and audio choices, we hope to start a conversation on what kinds of interactions are more effective in evoking certain emotions, what kinds are not, and why. This is the first blogpost in a series of eight on the lessons we learned about each emotion, as well as the development process as a whole. 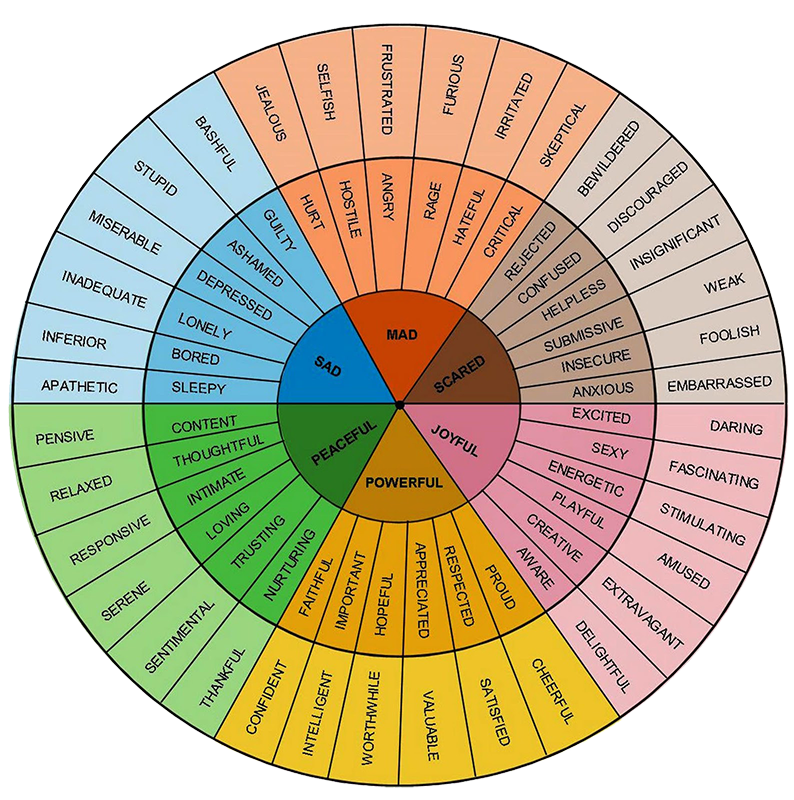 In the emotion wheel, daring is in the joyful quadrant. To feel daring is to want to take risks, to choose a path perhaps shaky and treacherous, in order to achieve success. Our prototypes this week hence sought to evoke the feeling through various manners of risk. Melody’s game, Bet your hearts out and Win those diamonds, pits two players against each other in a game where the score each gets depends on how much higher a goal they set for themselves than the other player, and whether that goal is achieved. A higher goal comes with greater risk, but successfully pulling it off reaps so many points that a lagging loser could become the winner in one round. The game expects that players will try to out-bet each other in order to win, experiencing the daring emotion in the process. 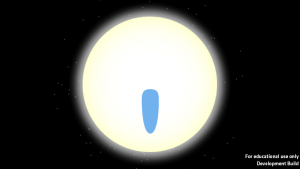 In Mac’s game, Born, the player plays as a roundish pod that bursts out into a world of sharp dangers, wide gorges, and never-ending heights. When the player arrives at a platform where all they see is the sky, will they turn back or jump? The game uses the common platform mechanic of jumping to embolden players to head into the unknown. 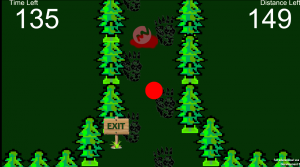 The player starts off with a group of fellow circles in the middle of the woods in Joseph’s game, Forest Escape. At a fork of the path, the group splits, after seeing ominous footsteps. How will the player get to the exit? What will they do when one by one they see the corpses of their circle friends? The hypothesis behind this game is that the player will experience the feeling of daring when they choose to walk shorter paths that are littered with "Danger" signs. Players play as a hacker in Rahul’s game, Start Hacking. 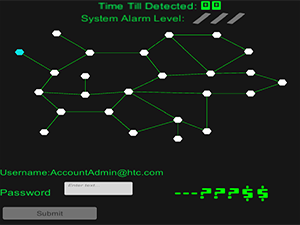 Time is running out as they unlock nodes in order to uncover the characters within the password. Will they only input the password when they are absolutely certain of every character, or will they guess the still unknown characters? 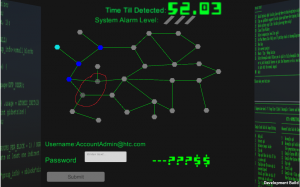 The hypothesis was that players will be pressured into taking a risk due to the time pressure, and instead of finding the complete password by unlocking all the nodes, would try and guess the password with the information at hand. 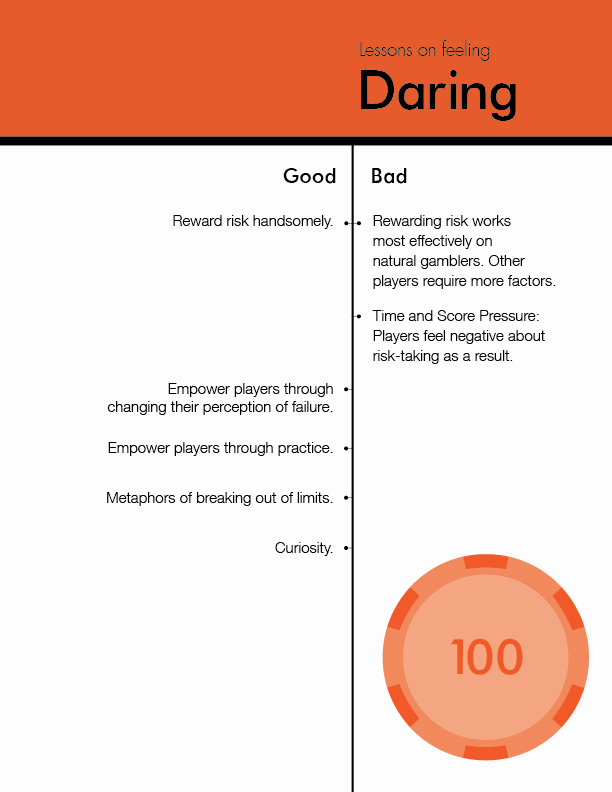 Daring Lesson #1: Rewarding risky behavior works – but mostly on players who are inclined to take risks. We thought that giving players an incentive to take risks, in the form of greater rewards, would encourage them to do so. Yet, the very nature of risks was the increased possibility of failure as well. Failure deterred those who were not natural gamblers from taking risks, despite knowing of the potential rewards. On the other hand, players who were natural gamblers felt extreme excitement in striving for those rewards, and the payoff intensified those emotions. The lesson we learned from this is that rewards work only for a certain type of player, and in order to encourage a daring attitude in other players, the punishment for risk-taking cannot be severe. Conservative player vs huge gambler: In a game where the maximum they can bet is 8, Ben has chosen to bet that he can get only 4, while Teresa goes ahead to bet that she can catch all the diamonds. 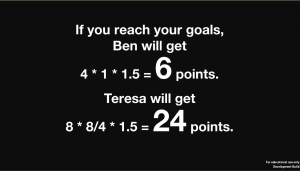 The score difference is based on how much more Teresa bets over Ben, and the possible high score excites Teresa. In Bet Your Hearts Out And Win Those Diamonds, we observed some players, whom we later labelled as natural gamblers, setting seemingly impossible targets for themselves, even after successive failures. We found that these players liked the prospect of a challenge, and were excited by the potential high scores that they might get. This was exactly the feeling we were going for — an unreservedly positive attitude towards tackling challenges. On the other hand, we observed other players who bet conservatively every round, even though some of whom were performing better than they allowed themselves to bet. Despite seeing their more daring opponents reap rewards from their big bets, they continued to bet in the same fashion as they wanted to give themselves room for error, and were not confident of achieving a bigger challenge. In their cost-benefit analysis, they would rather get a small number of points than none, which was what they would have gotten if they failed to hit their target. Daring Lesson #2: Time and score pressure cause some players to take risks, but not in a way that makes them feel positive. Some of our games tried to push players to take risks by putting pressure on them. We found that when pressured, some players were indeed more likely to make snap decisions that favor bigger risks. Unfortunately, many of these players do not perform well under pressure, causing great anxiety and panic when taking those risks. This was a negative attitude opposite to the feeling of being daring, because the force that compelled these players to take risks did not come from within themselves. The two circled nodes are currently being unlocked. The unlocking process takes a few seconds and the player is unable to do anything but watch the timer run down. 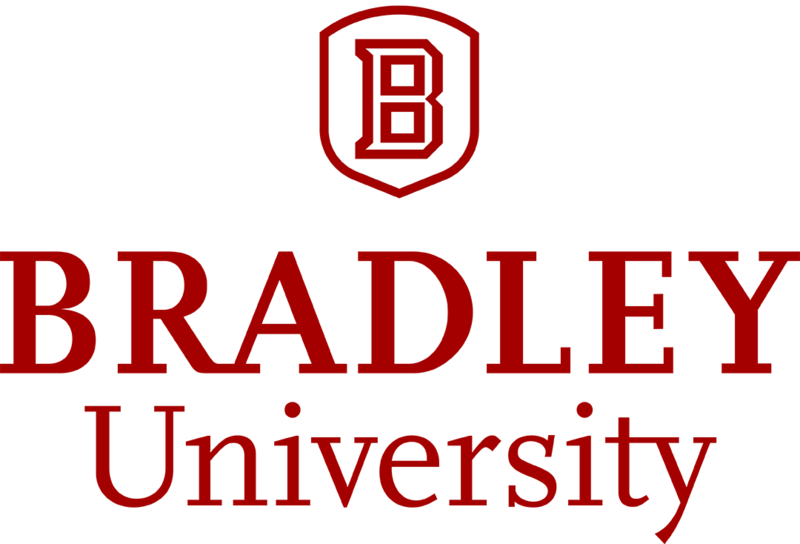 Unlocked nodes do not necessarily reveal any characters of the password, leading to greater uncertainty and anxiety. Start Hacking makes players wait as nodes get unlocked. As the timer wound down, we observed that some players panicked and made a guess even though they were not confident of their answer. As a result, they were unhappy about their decision to do so. The score difference widens with subsequent rounds, and Teresa has to bet a higher score in the next round despite her poor performance in order to have a chance of catching up. This generates greater unhappiness within her. 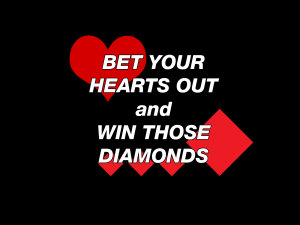 Bet Your Hearts Out And Win Those Diamonds has a skill component which involves fast reaction times. In some matches, players lost consecutive rounds as they buckled under the pressure, leading to a widening score difference. Because the only way they could attempt to win was to bet high and hope for the best, these players made more unwise bets that did not match their performance. The penalty for taking risks they did not want to take further intensified their negative feelings. Daring Lesson #3: We need to empower players to take risks, and having more practice is one of the ways. In Bet Your Hearts Out And Win Those Diamonds, players go through five rounds of repeated betting and playing, and the score is a total from all five rounds. 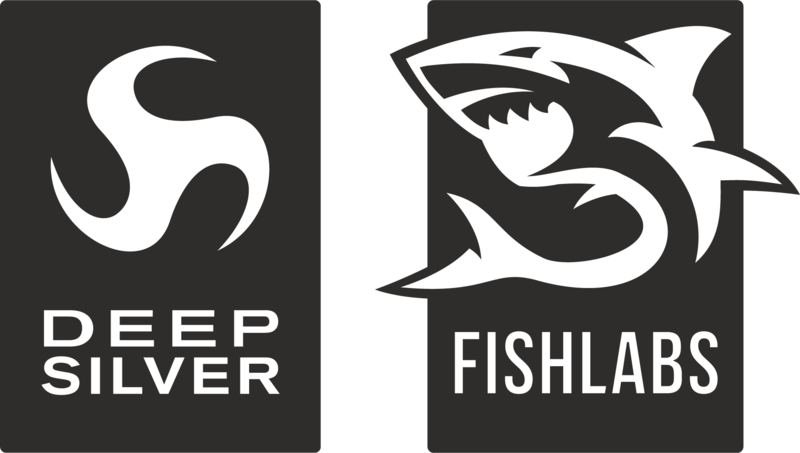 As a result, we saw players gaining confidence from the practice and betting higher bets than their initial rounds. The bigger lesson to learn from this is to have interactions that will increase players’ confidence, so that at the point of risk-taking, they will be more inclined to do so. Daring Lesson #4: Not thinking of an outcome as failure encourages exploration. When players do not perceive a consequence to be a failure, they are more open to experimentation, and venture out of their comfort zones out of their own initiative. This allows curiosity to take over as the dominant emotion, where the urge to discover overcomes reservations due to danger. The screaming sounds, the ominous footprints, and the corpses lying ahead prompt some players to overcome their fear to investigate the cause. 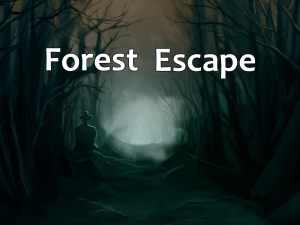 In Forest Escape, even though players were aware of a possible danger that lies ahead and saw consequences of that danger, we saw that some of them still ventured onto the dangerous path in the spirit of exploration. Some of these players did it because they were bored by the path they were on, while others simply wanted to find out what the cause of the ghastly deaths and screaming they encountered was. In this instance, they did not perceive death to be a failure, and hence felt free to pursue their curiosity. This was helped by the absence of negative events in the game, leaving the player free to continue pursuing the path. The red spikes simply push the blue pod away instead of causing death. Typical negative events that happen in platformers, most notably death, are not found in Born. Even as the pod comes into contact with spikes or falls into gorges, it simply bounces back or gets returned to the point from which it fell. Our players hence were fearless in jumping off the peak, knowing that the worst that can happen to them was to be returned to the point they jumped from. The caveat of this lesson, though, is that by eliminating negative events entirely, the player cannot be said to be daring as they do not view the actions they take as risks, merely as equivalent alternatives to other actions. The game designer must hence be careful to decide what the right levels of negative consequence in their games are. Daring Lesson #5: Metaphors for breaking out of limits set a positive tone for the rest of the game. 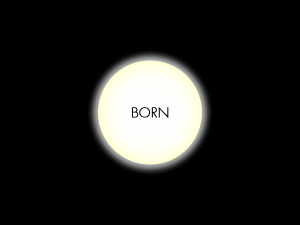 Born has two metaphors of breaking out. 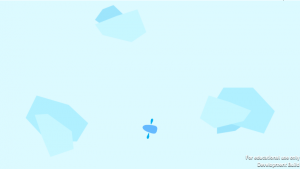 The first happens at the start of the game as the player breaks the membrane that previously held them in, and the second happens at the end when players gain the ability to fly as they fall. 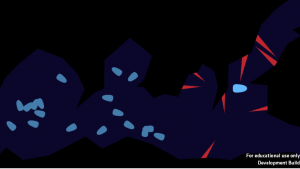 In addition, the player is always moving right and up, which are directions of progress in a platformer. These metaphors created a feeling of satisfaction in our playtesters, and built a foundation of empowerment that enabled them to venture out further. We observed all of our players, after the initial stage of breaking out, facing the subsequent stage of spikes with equanimity rather than fear. The effectiveness of pressure, rewards, and challenge to inspire daringness depends very much on the type of player. Players who respond well to challenge take very well to incentives, while players who buckle under pressure need encouragement from practice as well as metaphors of empowerment. Encouraging a positive perception of failure helps the latter type of players significantly, but done too liberally and so-called risky choices become no different from other choices. Finally, the behavior of risk-taking does not reflect a daring attitude, and the force pushing the player to take risks has to come from the player themselves.